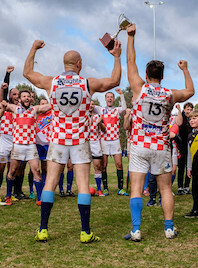 Croatia are Division 2 Premiers for the 2017 International Cup, after running away with a convincing 66-point win over Germany in the final at Royal Park today. The Germans were in the contest for the first half, before Croatia's big forwards wore them down in the third, then completely blew the game apart in the final term. The match kicked off with the weather degenerating into torrential rain and squalling winds. The Croatians took the early ascendancy, but could not make use of their chances. Two free kicks to Jakob Jung across half back, took Germany into attack, but the Eagles could not complete forward plays. The Croatians steadied and bottled up play in their front half, with the imposing frame of Josip Habljak marking and driving deep from half forward. With the weather conditions uglier than Brian Barrish's 10th Grade Spanish Teacher, neither side was initially able to hit targets or set up clean chains of possession in the first 10 minutes, with the play running from ball up after ball up. Although the Croatians were doing most of the attacking, it was Germany who finally capitalised on a chance, with Jakob Jung kicking long to the goalsquare from a free, where Johannes Binninger soccered the ball through for a goal out of mid-air. At this point, for a few minutes it was the Germans in control, until gun forward Ivoš pulled down a mark in the pack to goal for Croatia in reply. Back in the centre, German star Jakob Jung looked to be knocked out while roving in the pack, and while play went on for another 30 seconds, the quarter played out with the Croatians a point ahead at the first break. In the second term Cvetko shot early from 50m, but only managed a behind. The game was grinding on into a stalemate, with Schuetoff having a few long kicks forward for Germany, but no Eagles being able to cleanly mark for a shot on goal. In defence, Sebastian Esche was holding up play well, with Phillip Evermann and Martin Schuetoff everywhere for Germany. However, as the rain eased up and the sun started to break through, the Croatians found their rhythm and started to break the game open. Tomislav Cvetko took a pack mark and goaled to put Croatia ahead. A few moments later, Ivoš went back with the flight and took a spectacular mark, but his kick for goal on 50 floated out of bounds on the right. Kravar marked at centre half forward to kick inside 50m, but Ivoš couldn't hang onto the mark. However, in the following scrum, Ivoš received a free for in the back and kicked his second - Croatia now 14 points up. The Croatians were hitting targets, whereas the Germans were getting plenty of the ball but couldn't nail a receiver. Late in the term, Josip Habljak roved and goaled in close. Ivoš marked right on the siren, but couldn't make the distance and saw no score recorded. As the third quarter opened, the Germans couldn't get out of defence. The Croatians were shutting down any German attacking plays, with Habljak and Kravar impenetrable across half back. However, whilst the Germans couldn't mount an attack, the Croatians left the door open by not being able to kick a goal despite having the ball in their front end. For Germany, Jakob Jung, Tobias Menzel and Phillip Evermann were working hard across half back, and Croatian power forward Ivoš being tripled-teamed to try and stop him kicking any more for the Knights. The arm wrestle continued until the long-haired Nedić finally kicked one for Croatia, after pulling down a pack mark in the forward pocket. Shortly after, Tomislav Cvetko received a 25m penalty to kick another, putting the Knights 6 goals up and shutting the gate on chances of a German comeback. Croatia's tally of 2.3 for the quarter didn't really reflect their dominance, with Germany's lack of a strong forward targets such as Croatia's Ivoš or Kravar starting to show. The final quarter opened with Ivoš roving for a goal. The Germans finally put a score on the board, for the first time since the first quarter, when big Fabian Cordts marked and ran in, but only managed a point. Germany were looking more inspired, but another behind was all they were to manage for the remainder of the game. At the other end, Kravar marked and kicked a goal, 9 minutes into the last term. The floodgates opened and Habljak kicked another a few minutes later. Any German kick out of defence was being marked by the Croatians, whose attacking became relentless. Ivoš roved for another, booted in the goalsquare. 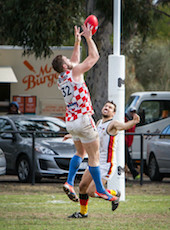 The Croatians were linking together kicks from the centre, finishing with the captain Cvetko, who kicked another goal from outside 50m, capping off his best on ground performance. When the siren sounded, the Croatians were 66 points up, 11.8 (74) to Germany 1.2 (8). 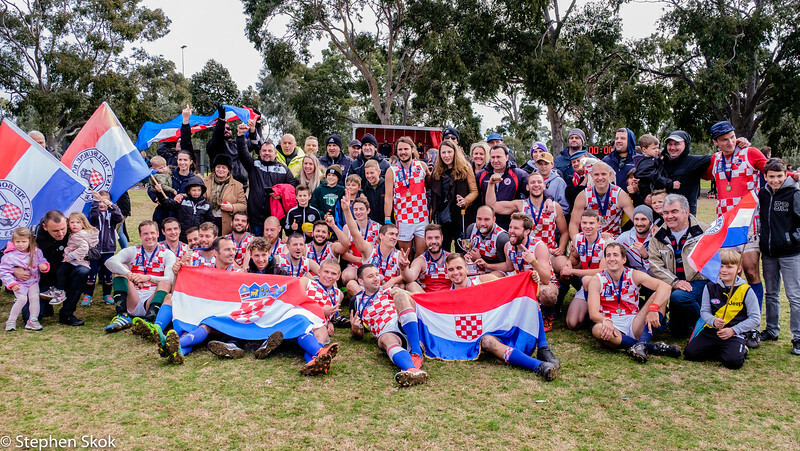 With their famous mascot duck (borrowed from the Melbourne Knights soccer club) in the red and white checkered jumper, the Croatians celebrated whilst a flare went off in the background. German coach Mark Woods was proud of his players' efforts over the tournament, saying "it was tough today obviously, we fought hard given we only brought a squad of 24 over, or at least 26 of which two could only play one game. But for a squad who'd never played together in its entirety before round one, they did well." Croatia's playing coach Josip Kravar noted his side had adapted quickly to full-field footy, after mainly playing 8 or 9-a-side footy in Europe. "In every game we saw our mistakes, but improved each time, and today didn't make so many mistakes. After the first quarter, we got it together. 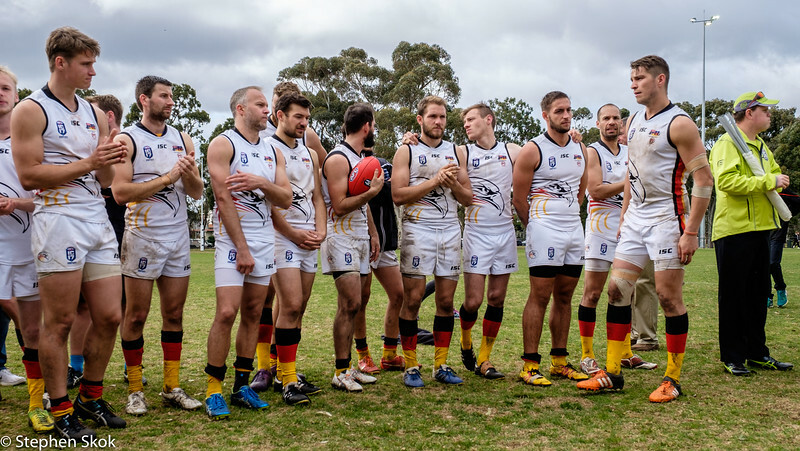 Our forwards' marking ability and goalkicking won it for us." Both sides have impressed in their first IC appearances and WFN looks forward to seeing them in action again in 2020 at least, hopefully earlier!